Nicola White shares her time between London and Guernsey, spending 3 months of the year in St Sampson's, where her family now lives. Born in Cornwall in 1968, Nicola grew up by the sea and is particularly influenced by the naïve styles of the St Ives artists, Alfred Wallis and Bryan Pearce. Following her family's relocation to Guernsey, Nicola has continued her explorations of the coast and sea through her work. 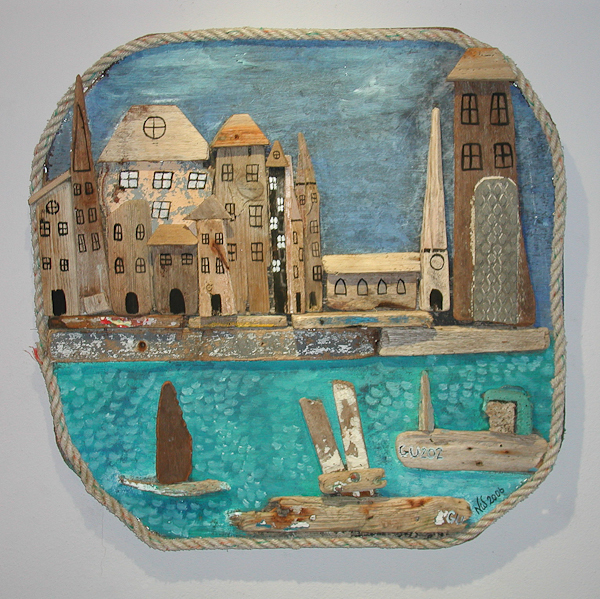 'Washed Upon Guernsey' is made from pieces of wood collected along Ladies Bay and L'Ancresse. 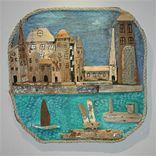 The individual quirky shapes and characters are put back together like an abstract jigsaw puzzle and brought back to life to create a picture of a typical Guernsey harbour scene which may have been part of their past. The wood is kept as simple and natural as possible with minimal addition of paint. This, both to respect the natural shaping of the wood by the sea, and to reflect the naïve and childlike style of the picture".